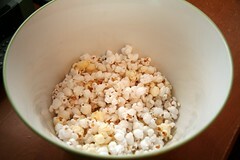 I have mentioned before the magnificence of Rich's freshly popped popcorn. I've also waxed poetic about the swooning powers of such fine specimens of popcorn. Something in my subconscious brain goes into helpless girl mode when I see the perfect bowl and I realize how lucky I am to have him and how I'd be doomed to gross evening snacks without him. Tonight, though, it was a treat for everyone since I had just painted my nails and couldn't grab the popcorn in my hands, thus forced to tilt the popcorn bowl to my face. I offer my snacktime experience for your amusement as well.